Vendors, speakers, and volunteers enter Soaring Eagle Retreat from Horner Chapel Rd. 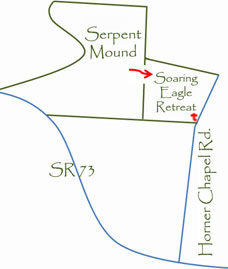 There are many theories, stories, knowledge, and unknowns with Serpent Mound. The Friends of Serpent Mound started this festival as a way for the public to share and learn about the many facets of Serpent Mound. Our speakers have varied from locals, historians, Native Americans, scientists, spiritualist, and more. We are neither inclusive, nor exclusive. This started as just a one day event in 2009, and we are ecstatic that it has grown into a 4-day festival this year! By having this festival in the neighboring field to Serpent Mound, it gives everyone an opportunity to enjoy the natural ambiance of Serpent Mound sperately from the hustle and bustle of the festival. ~ Along with ways to enjoy Summer! We had about 300 visitors at our 2011 one day event, that enjoyed 7 speakers and 11 vendors. Our goal was to double the number of vendors for 2012 and we ended up having 32 register! Vendor space was limited to 45 in 2013 and every space was reserved and most of the vendors returned in 2014, where our attendance varied from 200-800 people a day! In 2015, the festival was moved to private property adjacent to Serpent Mound, called Soaring Eagle Retreat. There were over 50 booths and even with 3 days of off and on rain everyone seemed to have a good time and vendors prefered being able to camp right next to their vending spot! 2016 we had a good year, and It will keep growing! Vendor Fee is $50 for a 12x12 space, plus one can primitive camp right behind your spot! We do ask each vendor to donate one hour of their weekend to help us, they can either sign up at the FOSM Booth and help with a caper or do an approved 45-minute demonstration, workshop, hike or concert during the weekend. 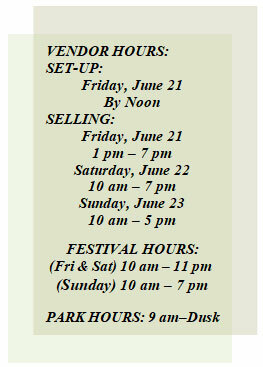 We ask that booths be in place by 5:00 pm on Friday, June 21, 2019 and no later than 10 am on Saturday, June 22, 2019. Please, let us know in advance if you need to set up Thursday evening. You may offer an approved fee based workshop, where the public goes home with a selfcrafted item! We actually had the public request them! We can either offer a pre-registration site for you or share a link to your own registration site. Or money can be collected at the class. We offer 60 spaces total, so register early to get last year's spot! Space is limited and sells items are juried! Hurry, spaces will fill up fast and there will be no unregistered vendors admitted during the event! and email1 or email2 it to us, and once the committee reviews it, we will notify you, THEN you can pay the fee here or mail it in. Thanks! You still need to contact us (or here) before registering or paying through PayPal! Once you contact us please fill out a 2018 form.